Stockport County made easy pickings of a dodgy Bulls' backline to overcome Hereford United 4-1 at Edgeley Park this afternoon. The hosts took a lead within 15 seconds of the start with Dominic Blizzard nipping into finish with ease. United managed to level through Sam Hewson before Matty McNeil headed from a corner to restore the lead. In the second-half, County dominated against a lacklustre Hereford side and added two more goals through Matty Mainwaring and Leon McSweeney. With Kris Taylor suspended after picking up his fifth card of the season against Walsall, Richard Jackson was bought in at right-back with Richard Rose moving to left-back. Ben Smith made way in central midfield for Hewson, who had recovered from a groin strain. There was no place in the County team for Jimmy McNulty, who is set to leave the club on Monday. Two former Hereford full-backs were included; Robbie Threlfall was preferred to start with Michael Rose having to be content with a place on the bench. Stockport kicked off and a long-ball from Johnny Mullins up field was completely mis-kicked by Karl Broadhurst allowing in Blizzard who made no mistake firing across Craig Samson to ensure a horror start for Hereford. There may have been a bobble which deceived Broadhurst, with the pitch causing problems for both teams throughout after Sale's rugby match last night. Oli Johnson received a pass from Paul Turnbull and ran at Rose, before firing towards the near-post forcing Samson to push the ball behind the post. Turnbull himself fancied his chances sending in a 20 yard shot which bounced before going wide. Hereford's first opportunity fell to Andy Williams, who turned his marker on the edge of the box but couldn't hit the target with a left-foot strike. McSweeney hit a free-kick just past Samson's post before the visitors shocked Stockport with an equaliser. A pass down the right-wing allowed Jennison Myrie-Williams to out-pace and outmuscle Threlfall before running into the box; he cut back onto his left-foot before picking out Hewson, who controlled before poking past Owain fon Williams from 12 yards. Threlfall soon made up for his lapse in defensive duties at the other end as he provided the assist for County's second. It had followed a sliced effort going wide from the Liverpool loanee as County won a corner; Threlfall swung it in at pace and it made its way to the unmarked McNeil who nodded in from close-range. Although it was at the other end of the ground to the visiting supporters, it looked like poor marking and question-marks must be asked again over Samson's ability to take crosses. Myrie-Williams showed a good turn of pace down the wing before dragging a left-foot shot well-wide. Just before half-time Turnbull headed over from another Threlfall corner. The second-half was fairly routine for County who dominated possession and played around Hereford. They were rewarded for their play with a third goal when a Tommy Rowe corner wasn't cleared and Mainwaring somehow managed to weave his way past two players inside the crowded box before shooting into the corner. Hewson sent a snapshot half-volley wide after Matty Done had crossed from the left before both sides made a sub. Simon Johnson was introduced for Williams, who again had a disappointing afternoon whilst M. Rose replaced Threlfall. Rowe's burst into the box after picking up a ball from a loose header saw him force Samson to make a close-range block to stop a goalbound left-foot effort. The hosts made sure of their win with a fourth goal in the 76th minute with yet more poor defending contributing to the goal. M. Rose was found on the left and he crossed into the box; Samson came to claim but instead punched out to McSweeney who controlled before sending a relatively weak shot goalwards and it ended up in the back of the net after Broadhurst failed to make, what looked like, a routine block. Late subs were made by both teams, which really dampened the end of the game. James Vincent and Danny Pilkington came on for County in place of McSweeney and Blizzard, whilst Hereford gave Sam Gwynne and Dean Beckwith a run-out in place of Done and Broadhurst respectively. In the closing moments, Samson dived to his left to save a placed shot by Pilkington but it was the last of the action as Stockport passed their way to the end of the match. It was a crushing defeat for United, who never came close to matching their opponents. It had little to do with Stockport's quality, but more to do so with Hereford's lacklustre approach; defensive mistakes coupled with the midfield's inability to close-down led to the result. Up top, there was little which offered excitement for United with Williams again failing to deliver on a number of half-decent openings. Next up for Hereford is the painfully long trip to Carlisle on Tuesday, lets hope it'll be a better journey back from Cumbria than it was from Stockport. Stockport: fon-Williams, McSweeney, Mullins, Raynes, Threlfall, Turnbull, Blizzard, Mainwaring, Rowe, Johnson, McNeil. Subs: Pilkington, Rose, Dicker, Thompson, Vincent. Hereford: Samson, Jackson, Broadhurst, Gowling, Rose, Myrie-Williams, Diagouraga, Hewson, Done, Guinan, Williams. Subs: Veiga, Beckwith, Gwynne, Smith, Johnson. Sam Oji appears to have been released, with his profile no longer listed on the official website. Oji's contract was up in January, and he was named as part of the squad for the Oldham match on the 17th. However his profile has since been removed from the squad list suggesting he has also been cut from the squad, following Garry Breen out of the door. Assuming that Oji has departed, as it has not been confirmed by the club, the squad will be down to just 21 contracted players of which two will not finish the season with the Bulls due to their loan contracts expiring. Sam Hewson will have departed with five matches left, while Jennison Myrie-Williams will miss the final match even if his loan is extended to the maximum 93 days. Of the 21 neither Craig Jones nor Jack McLeod appear to be considered ready for League One football. Jones' only first team action was a loan spell at Conf North side Redditch, while McLeod's time this season has been limited to two sub appearances in August. Stephen O'Leary will miss the bulk of the remainder of the season through injury, and the status of both Clint Easton and Bradley Hudson-Odoi remain unclear. While Easton has been generally listed as having a hamstring injury for the past six weeks, Hudson-Odoi has not once been declared an injury victim, nor has he been seen on the pitch for over two months. He remains the club's second top scorer at a time when a striker is required in the matchday sixteen. GT: "Way Short Of The Requirements"
"We were way short of the requirements for first division football." That was a simple summary of the game from Graham Turner, speaking to BBC H&W's Keith Hall. "(I'm) upset about the level of performance and about the work we've put into it. It's been unusual this season where we've complained about the way we've worked. Generally we've put ourselves into a game and worked very hard and in a lot of games, particularly away from home, we've played reasonably well. But today we were short, way short, of the requirements for first division football. "Why that has taken place I don't know. I think there was a bit of upset about the pitch, the state of it to start with, and then we concede a goal -20, 30 seconds - where it was laughable. After that we looked as though we might get into it but, unfortunately, they outplayed us and outworked us. "It's one of those days that you have to take stock, look where you can change it for Tuesday against Carlisle, thankful we've got another game coming up fairly quickly so we can forget all about this one. It's not humiliation, but it's certainly not far off." When asked about Karl Broadhurst's substitution, Turner added "We've got to think about what we do at the game on Tuesday, maybe that's a pointer." adding that Sam Gwynne was firmly in his thoughts for Tuesday. Turner reiterated his hopes for new faces: "Over the last 48 hours we've lined up two players to come, agreements with their clubs, we had one club send the forms over to us signed just waiting for the player to agree. Then, just as we're booking him into a hotel he phoned us to tell us he's signed for a Championship club. The other we had agreement with, bigger clubs got wind of it and he's finished up at a bigger and higher up the table team than us. "There is one almost definitely signed. He's going into his club over the weekend to sign and will join us on the way up to Carlisle." The Bulls were by far second best according to the stats from today's game. Possession was said to be 59% for the Hatters and 41% for the Bulls. The home side managed eleven efforts on target to the Bulls two, with the Hatters also edging the off-target shots 5-4. The Bulls forced only one corner to Stockport's thirteen and unusually committed more fouls, nine to six. Sam Hewson was the only player to be booked, for a rash tackle after a short ball from Toumani Diagouraga left him struggling to retain posession. On the player ratings Myrie-Williams and Hewson both got sevens, the rest were all sixes and fives. For Stockport Mainwaring received an eight with the bulk of the rest getting sevens. 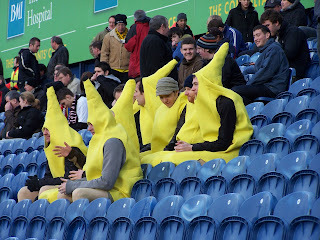 Attendance: 5586 with about 180 from Hereford including eight bananas. Gavin Williams and Michael McIndoe scored the goals for Bristol City as they beat Barnsley. Paul Parry scored the opener as Cardiff beat Nottm Forest. Gary Hooper scored twice as Scunthorpe won at Millwall. Craig Stanley scored Morecambe's goal as they drew with Port Vale. Matt Bailey scored for Northwich, but they were hammered 4-1 by Woking. Graham Evans scored a hat-trick as Aberystwyth beat AFC Llwydcoed in the Welsh Cup. Danny Carey-Bertram scored the only goal of the game as Telford won at Kettering. Leicester remain ten points clear after a 2-1 win at Northampton, with second placed MK Dons beating now-bottom Cheltenham 5-3. Scunthorpe are up to third with a 2-1 win at fifth placed Millwall, with Peterboro slipping to fourth after Huddersfield beat them 1-0. Oldham stay sixth after a goalless draw with Swindon. Leeds suffered a surprise 1-0 loss at Walsall, leaving them still four points short of the play-offs. Down the bottom Crewe climb two places after a 2-1 win over Tranmere. That win dumps Cheltenham, who saw second half sub Damian Spencer score a 15 minute hat-trick then get sent off, to the foot of the table. Leyton Orient slip into the bottom four after being beaten by a Yeovil goal six minutes into injury time. Brighton's 2-1 win over sliding Hartlepool pulls them to a safe spot, level on points with Swindon. Carlisle slip to within six points of the drop after losing 2-0 at home to Colchester, while Bristol Rovers remain worried after a 1-0 loss at Southend. In League Two Wycombe finally got back to winning ways with a 2-1 victory over Accrington. 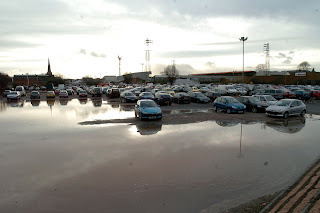 Brentford beat falling Shrewsbury 3-1, with the Slop now in ninth. Chester fall to 20th, but are 13 points clear of 23rd place Bournemouth, with a 1-0 home loss to Gillingham. The Bulls lost today's League One match 4-1 to Stockport County. While the scoreline may have flattered the Hatters the Bulls did themselves no favours from the start, conceding the opener after a reported eleven seconds when Karl Broadhurst misjudged a bouncing ball. Loanees Sam Hewson and Jennison Myrie-Williams combined for an equaliser, but the Bulls were soon behind again and got only one more shot on target. The Bulls slip a place to 23rd, and are now seven points short of safety. Carlisle have signed winger Lewis Neal until the end of the season. The former Preston winger, released earlier in the month, spent November with Notts County where he made six appearances. Cheltenham keeper Shane Higgs will stay with Wolves until the end of the season. Leeds have released defender Scott Gardner by mutual consent. The 20 year old had only one League appearance to his name. Walsall have signed Aston Villa reserve striker Sam Williams on a months loan. He has scored four times in 22 games for an assortment of loan clubs. Leicester have cancelled the contract of striker Eric Odhiambo by mutual consent. He failed to score in sixteen matches for the Foxes and various loan clubs. Brighton have agreed to sign Oldham striker Craig Davies after the two clubs agreed a small fee. Yesterday Hereford United manager spoke about his hope that he would be able to keep the club finances in good order despite the credit crunch. Under Graham Turner's tight controls, wages at Edgar Street are not expected to rise much above the £1M mark this season. However this morning comes news that Carlisle, where Hereford United visit next Tuesday, are suggesting their wage bill will rise to £2M this season. Recently Carlisle sold Simon Hackney to Colchester for £105,000. This sale appears to have been required to balance finances. The club has brought in Graham Kavanagh and Joe Anyinsah during the transfer window. They have also extended several players contracts. "Players of this stature – they include internationals and ex-Premier League players – do not come cheap,” said cheif executive David Allen. “In fact, our accounts next summer are expected to show that players’ wages will break the £2 million mark for the first time in the club’s history. The £1M+ at Hereford and £2M at Carlisle still look low when compared with Leicester who spend over £10M on wages. BBC Hereford and Worcester will have full commentary from Stockport this afternoon for the League One match against Hereford United. As ever Keith Hall will be their man at the match and he is set to have former Bulls' keeper Matt Baker at his side. The commentary will only be available on 94.7FM in Herefordshire. As ever there will be text coverage from various media outlets. Meanwhile the Stockport pitch looked to cut up quite badly last evening as a result of the game of rugby taking place on it. Hereford United manager Graham Turner has said he will look at the pitch this lunchtime before taking a final decision on the composition of his squad for the game. Garry Breen has left Edgar Street after failing to make a first team appearance. His agent David Threlfall, brother of ex-Bull Robbie, told Sky Sports: "Gary and Hereford have decided to part company by mutual consent. For one reason or another it never worked out for Gary at Hereford, but he wishes them well. "Gary is set to link up with Macclesfield next week for short trial and we will see what happens with that. But there are other clubs interested in Gary and he will keep his options open and see what offers come in for him." Breen arrived at Edgar Street as one of Graham Turner's first summer acquisitions, speaking highly of the Man City youngster on his arrival. But, despite a number of promising pre-season performances, he never even made a substitute appearance for the Bulls with the management having a trio of other centre backs come in instead. Richard Jackson could re-gain his place in the Hereford United starting eleven tomorrow at Stockport as Kris Taylor is suspended for the game. It's probable that Richard Rose will be asked to play at left back in place of Taylor allowing Jackson to play at right back. Loanee Sam Hewson is rated doubtful for the game so Ben Smith may continue to partner Toumani Diagouraga in mid-field. Manager Graham Turner is expected to look at the state of the pitch before deciding the final line-up. Should conditions be very heavy then Sam Gwynne may be favoured over Smith. Turner will also have to decide whether to start with Jennison Myrie-Williams or perhaps Simon Johnson on the left wing. Johnson came on for Myrie-Williams against Millwall last Tuesday as the Bristol City player looked ineffective on the night. In his Official Site interview earlier today Turner admitted he hoped to have two new players in shortly. However this was unlikely to be in time for tomorrow's match. As for Stockport they will be without midfielder Carl Baker and strikers Peter Thompson and Oli Johnson. Assistant manager Peter Ward is aware that Hereford have hit a patch of form lately. "It's going to be tough. They will be full of confidence, but our lads have been very professional in preparing for games whatever has been going on off the pitch." However Graham Turner appeared quietly confident of getting something from the game. "We've generally done quite well at Stockport. We've won there on the last two occasions," Turner told BBC Herefiord and Worcester. "We've got to go there, keep our spirits up, keep working at it, keep the shape of the side and hope we get the breaks. "Sooner or later our luck has got to change because I don't think we've had any so far this season and if it does we have to be ready for it." This is a Friday reminder to all competitors in the Prediction League that you can predict for this weekend's trip to Stockport County. Will you back the play-off chasers? Or will Hereford win for the third year running at Edgeley Park? To enter, send in your final score and attendance predictions to bullsnewspredictions@hotmail.co.uk along with your username. In Graham Turner's weekly interview with the official website he reveals that there will be no permament signings this season with two loan players the only ones to be pursued. The decision may not be the best received news amongst Bulls fans, but there is method in the madness. Any player to make a permanent signing now would usually be a player out of contract in the summer, and would likely only move for the security of a contract for next season as well meaning a rash decision now would penalise the squad next season - whichever division they find themselves. With the season ending with the visit of MK Dons on May 2nd - barring an unlikely surge for the play-offs - any player signed on loan from today onwards would qualify for all remaining matches under the 'emergency' loan maximum limit of 93 days, effectively making them a fully fledged squad member for the remainder of the season providing the loan deal prevents a recall. In his weekly interview with Jamie Griffiths, the Hereford United manager has reassured supporters that, at least in the short-term, the club contiunues to be run prudently. "We've run the club as near as possible as a business. We want to make sure there is a long-term future at this football club so we haven't spent money we couldn't afford," said Graham Turner. "We've obviously sold players from time to time which has accumulated a little bit. "If we have a period where it becomes very difficult financially, if gates drop off, sponsors go by the wayside, season ticket holders don't renew, problems clubs are going to face, we'll be no different. "Then, in the short-term, we'll be okay. "It won't be that in the short-term we will be scrambling to sell any players or going into administration. That won't happen. We've got a little bit of a cushion that will see us through the short-term. "I think the difficulty for football clubs is that if one goes then it will be a domino effect. "As I understand it there's quite a number that are in debt to the taxman and if he decides to get tough if could be curtains for one or two clubs. "We've had a period where if we were a couple of days late with our tax cheque he was knocking at our door. Now we are on a quarterly payment and we are always on time." Leyton Orient have confirmed the club are in takeover talks. Terry Byrne, an advisor to David Beckham, has been confirmed as heading a consortium to invest in the club with a statement reading: "Owner and Chairman Barry Hearn is in discussions with a consortium of investors headed by Terry Byrne with regards to the future ownership of the football club." Beckham himself has denied any involvement in the bid, having been born near the ground, with Sky Sports claiming that Zabeel Investments are the main party. The Dubai based company previously had talks over takeovers at both Newcastle and Charlton. The news comes shortly after Hearn offered to buy the stadium from the club to clear it's debt to him. Publically, right up to last weekend, Hearn was vocal about the club surviving the credit crunch because of his support - but now appears to have had a rapid change of heart. Some Millwall supporters are said to have made racist chants against their striker Lewis Grabban aduring the game against Hereford United at Edgar Street last Tuesday. The youngster was reported to have stormed down the tunnel and was first on the team bus as the abuse was said to have got to him. "It is a small minority and it is something that I have to deal with as part of being a footballer," Grabban told the Southwark News. "It's a bit difficult to deal with. But I have to be strong and able to get on with it. It would of course be better if we all worked together and got behind our players." A club statement from deputy executive chairman Heather Rabbatts said: "There were comments made of a racist nature towards Lewis Grabban from individuals at the ground on Tuesday night. "Lewis raised the issue with the manager, who will speak to him privately. The club will support all its players to ensure that they are happy, and safe and free from abuse. "There is no place for this in football. The club has made a massive improvement in recent year and maintains that any racist abuse is treated with the uttermost seriousness. "I am sad and disappointed that people with these unacceptable views still attend our matches, but our resolve will never be weakened to rid of them from our game." Leyton Orient have been offered £6million for their ground, by their owner and major sponsor Matchroom Sport Ltd - owned by Barry Hearn. The deal will see just £2.6million handed to the club, with a £3.4million debt written off. Shareholders have acted with caution to the offer, with the ground being leased back for 20 years at an initial rent free period - but the rent will be £180,000 after five years. After the 20 years lease the club would have paid over the £2.6million in rent, and wouldn't own the ground. Peterboro have signed the latest 'hottest talent in non-league' taking Hampton and Richmond striker Ben Wright to London Road on a three and a half year deal. The 20 year old has scored 13 times in Conf South this season, and was previously claimed to have joined Fulham for £50,000. Crewe have signed Everton keeper John Ruddy on a months loan. He played 12 times for Stockport on loan last season. Yeovil are giving a trial to former Shrewsbury striker Derek Asamoah. The 27 year old engineered a move from Shropshire to French football, but failed to justify his £50,000 fee and is a free agent. Glovers central defender Aaron Brown has accused the club of dragging it's heels over his contract with him still operating on a week to week deal, while striker Luke Rodgers will be out for a month with an ankle injury. The Glovers have signed Huddersfield midfielder Jon Worthington on loan. Departed Leeds striker Malcolm Christie has said it was he who decided to leave the club, rather than the other way round. Southend have signed Spurs defender Dorian Dervite on loan until the end of the season. The 20 year old Frenchman is yet to make a first team appearance at White Hart Lane. MK Dons have signed Chelsea youngster Carl Magnay, who won the second series of TV show Football Idol. Weymouth are claimed to be close to a takeover, and if it fails the club will fall into liquidation says Chief Executive Gary Calder. Former Cambridge chairman Lee Power, believed to be current Rushden director, and the millionaire brother of Rushden boss Garry Hill are claimed to be involved. The Terras' workforce was told they would not be paid this week unless the deal goes through, while Calder himself is claimed to be heading to Cambridge to replace one of two directors to have quit this week. Grays have relieved manager Wayne Burnett of his duties 'for his own sanity'. Ex-Bulls loanee Gary Phillips takes over as the seventh manager in three years. Northwich are now technically homeless after the liquidators confirmed their lease on the Marstons Arena was worthless. The liquidators are in the process of handing back rented equipment at the ground to its owners, and it could take several weeks for the ground to be sold and ready for hosting matches. The club have had their own winding up order with the taxman delayed until March. Walsall have confirmed that ex-Bull Chris Palmer has signed his new deal until the end of the season. Leicester have announced the signing of Wayne Brown, a defender from Hull. The 31 year old joins on loan until the end of the season with a view to a permanent move. Carlisle have offered former Leeds trainee Gavin Rothery a months contract. The England u-19 midfielder is a free agent. Swindon midfielder Mark Marshall has rejected a loan move to Bournemouth. Huddersfield have agreed a deal to sign Scunthorpe target Lee Novak, but will immediately loan the striker back to current club Gateshead until the end of the season. Scunthorpe have turned their attention to former Cheltenham forward Kayode Odejayi. Crewe are giving a trial to Chesham striker Danny Burnell. He has scored 27 times this season, and last season, for the Southern League Midland side. Leeds have loaned striker Tresor Kandol to Charlton until the end of the season. Southend have cancelled the contract of striker Richie Foran by mutual consent, and he is now expected to return to Scotland. Brighton have signed winger Seb Carole on contract until the end of the season after a trial spell. Bristol Rovers have confirmed they are continuing talks on funding the redevelopment of their stadium. They hope to have the funding in place by March, and will now remain at the ground while the work takes place. 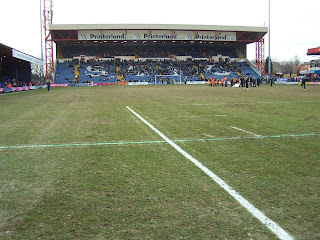 The Bulls travel to Edgeley Park on Saturday to face Stockport County in a League One match. Since the turn of the century all six matches so far have gone to the away side. The Hatters have four wins from three League and one FA Cup visit to Edgar Street, while the Bulls have won both the League matches at Edgeley Park so far. Last season a Lionel Ainsworth hat-trick was sufficient for a 3-2 win, with the season before being a shock 2-0 for the League newboys after relentless pressure from the misfiring Hatters. Stockport's decent start to the season has been overshadowed by their seemingly continual financial constraints since their Championship days. A decent young side has had the confidence knocked out of it as the For Sale signs went up on several of their prospects. Manager Jim Gannon, who had to make his own budget offer to the board to try and keep his squad, will have to pick them up off the floor after just one win in six matches. The Bulls will hope to have Sam Hewson back in contention to bolster a midfield that was broadly considered to be lacking during Tuesday's loss to Millwall. Steve Guinan (or is that Geenan) may be into double figures, but the rest of the squad still here have only scored nine between them in the League and the fans still hope for a striker to arrive before Monday's window deadline. Stockport County vs Hereford United, Edgeley Park, Saturday 31st January, 3.00pm. Stockport County have been in talks with their local council to see if their relationship could become "closer and mutually beneficial" according to the Hatters chief executive Mark Maquire. Maquire has also admitted, to the Manchester Evening News, that administration is less likely following the sale to Huddersfield of Anthony Pilkington. "Administration is further from the truth than it was two weeks ago, and has got even less likely," said Maquire. "We have a strong relationship with the Inland Revenue. "This all came about because we said it was necessary to sell players in the transfer window. "That has happened with Anthony Pilkington and that has taken us nearer where we want to be." As regards the meetings with the council Maquire said they were exploring every option in these difficult times. "Our duty is to try as much as possible to protect our fantastic squad of players if there are alternative ways of making the business go forward," he added. "We would be failing our duty as directors if we didn't explore every option. "The meeting came about having spoken to at least half a dozen other clubs about how they have a more active relationship with their councils." Stockport council leader Coun Dave Goddard said: "County have not directly asked the council for money, we are looking at a whole range of options. We are not ruling anything in or out. "We value Stockport County in the borough, their promotion last season was tremendous for the town." This follows an apology from the Daily Star after the paper wrongly attributed quotes to him after the Hatters game against Oldham last Saturday. "Such false comments undermine relationships within the team and damage the image of club, which the manager is fighting hard to protect during this important period," said the club. "This is not the first occasion this season that Jim has been misrepresented and, consequently, he will not now provide thoughts or information to media organisations outside the club." Meanwhile assistant manager Peter Ward has told BBC Radio Manchester that the financial situation at Stockport is a major distraction for the management. Recently Anthony Pilkington was sold to Huddersfield reportedly to help balance the books. "We are trying to do our own work and trying to plan things but you can't really. "It's a major distraction. One minute you're in the top seven and things are looking up. You look at your squad and you think you're healthy and if you could add a couple more players you could be challenging for it. "But then players are leaving and we just have to battle on as best we can." Former Hereford United striker Stuart Fleetwood could start for Charlton next Saturday. If so, it will be his debut for their first team. As reported earlier on Bulls News he has been on loan at Brighton and was due to play for them against Hartlepool on Saturday but Addicks manager Phil Parkinson has recalled him. Charlton are without Andy Gray so Fleetwood may take his place in the game which is against Burnley. Steve Guinan and Toumani Diagouraga have been named in the voting for the Football League Awards Player of the Year. The awards compromise a divisional Player of the Year, plus nominations for the Top 50 Football League players. A number of other awards will be decided by a panel including Family Club of the Year, Community Club of the Year, and Best Matchday Programme. Ex-Bulls in the list include Paul Parry, Michael McIndoe, Gary Hooper, Craig Stanley, and Adam Stansfield. You can vote for you choices on the FourFourTwo website here. In his weekly column in the this morning's Hereford Times, Graham Turner makes the point that football will feel the full effects of the recession next season. At present, he says, the game has been largely immune as much of the income, such as season ticket money, has already come in. "In fact, while there will be a lot of other clubs whose future will be in some doubt, good housekeeping over a number of years has meant that, in the short term, we can weather the storm," said Turner. "We have prided ourselves in running this club as a going concern. We are in a little bit of trouble at the wrong end of the table but there is scope to bring players in, even to pay a transfer fee if the right players are available. "But the one thing we can guarantee is that the long-term future of the club will not be put in jeopardy for a short-term solution." Stockport chief executive Mark Maguire says the sale of Anthony Pilkington has gone a long way to solve their current financial problems, but it has not wiped the problem out entirely. Millwall's game with Peterboro on Easter Monday has been picked for live Sky coverage. Southend fielded eight trialists in yesterday's reserve match, including internet legend Cherno Samba. The Shrimpers have signed QPR defender Andrew Borrowdale on loan. Brighton have signed Crystal Palace striker Calvin Andrew on loan til the end of the season after Stuart Fleetwood was recalled by Charlton, and want to sign Leeds midfielder Neil Kilkenny and Oldham striker Craig Davies but are likely to ship a couple of players out before making further moves. Harrogate are the latest Conf North side to ask their players to take a pay cut, while Farsley acknowledge they have a cash flow problem. Tranmere have finally loaned midfielder Adnan Ahmed to Port Vale for a month. The deal was set up last week, but Rovers wanted it to then be a three month term. Northwich's landlord has been formally declared bankrupt. Vics owner Jim Rushe has already agreed a £1.5million purchase with the administrators. Huddersfield have confirmed that they have invited Kevin Keegan to 'come and have a look'. Most of their backroom staff worked with Keegan at Newcastle, but rumours they want him as a senior figure to guide rookie boss Lee Clark are wide of the mark. Leeds have released striker Malcolm Christie after five games and one goal in three months with the club, while their game with Leicester on Easter Monday is also live on Sky. Hartlepool have loaned striker Danny Nardiello from Blackpool for the rest of the season. The former Man Utd trainee has struggled with a back injury this season. Millwall have signed QPR midfielder Adam Boulder on a free transfer after a previous loan spell. Scunthorpe have lodged a third bid, believed to be £100,000, for Gateshead striker Lee Novak. Stockport boss Jim Gannon will no longer speak to any press outside of the club's own website after receiving an apology from the Daily Star over comments attributed to him from a press conference he wasn't at. Aldershot have cancelled January transfer activity after gates dropped sharply. Their two home matches in 2009 have seen an average gate over 900 less than the first half of the season. The pitch at Stockport County on Saturday isn't expected to suit Hereford United as it is being used the previous evening for a rugby international. The England Saxons are taking on Portugal at Edgeley Park. And with the game priced at just £10 for adults and £5 for juniors, a large crowd is expected. How badly the pitch cuts up will only be known after the game but Graham Turner has already expressed his concern. "You've got a club with the status and standing of Stockport in the game. For them to have a rugby match on a Friday night prior to a game on a Saturday baffles me," Turner told BBC Hereford and Worcester. "We've got to go and have a look at the surface and try and adapt to it. "It won't suit the passing game if it cuts up on the Friday. We might have to adjust a little bit." With the last two visits to Edgeley having produced wins, The Bulls travel north on Saturday hopeful of continuing the run and returning with three desperately needed points. Stockport is generally a good day out although recent experiences have suggested that their stewards can be a bit less tolerant than some. Visiting fans are normally accommodated on the seated but uncovered Railway End although in bad weather, they are often allowed to move into part of the Popular Stand. Popular Side Stand: Adults £18, Concessions £11, Under 16's £5.Railway End: Adults £16, Concessions £11, Under 16's £5. Earlybird tickets are usually available offering a reduction of around £2 but as yet there is no availability advertised by HUFC. COACH - The only known coach travel is organised by HUISA. Departure is set for 9.30 am from Legends with a fare of £16 (£15 members). TRAIN - Departures from Hereford Station are at 07.55, 08.55, 09.55, 10.55 and 11.55 with the latest arriving in Stockport at 13.58. Journey time is a little over two hours. The ground is around half a mile from Stocky Station (several good alehouses en route). Exit the station and turn left up Station Road, go straight over a roundabout and then left into Caroline Street for the ground. Return trains leave at 17.40 and 18.39. CAR - M6 to junction 19. Take the A556 towards Manchester/Altrincham. Then join the M56 towards Manchester Airport. After a few miles leave the M56 and join the M60 towards Stockport. Leave the M60 at Junction 1 and head towards Stockport. Turn right at the second set of traffic lights to go onto the A560 towards Cheadle. Then turn left into Edgeley Road (there is a pub on the left hand corner at the lights at this junction). The ground is down this road on the right. Postcode is SK3 9DD. Distance 137 miles. You should allow two hours and forty-five minutes. ALEHOUSES - Plenty to choose from in the main street and around the ground with many serving the excellent Robinsons' beers. The Crown Inn is a fifteen-minute walk north from Edgeley and can be found under the railway viaduct by the M6 on Heaton Lane. It was the Stocky CAMRA Pub of the Year in 2008 and regularly has around a dozen pumps including a couple of ciders as well Stowfords keg. The Market Place is a good area to head for where you will find a selection including the Pack Horse and Bakers Vaults (Robinsons). The local 'Spoons is the Calverts Court at 13, St Petersgate in the centre. There is a small Labour Club next to the visitors entrance to the ground which I have used a couple of times. They charge a small admission fee but it is particularly handy for the late arrivers who want a swift one before the game. Finally, The Armoury is just five minutes from Edgeley and is likely to be my destination. It can be found at 31 Shaw Heath. It carries Robinsons' Hatters, Unicorn and Old Tom. If the Old Tom tempts you, you're advised to treat it with respect as it is 8.5%! The Armoury is well used by home fans but well-behaved visitors are usually made welcome. Hereford United have said that they expect to receive another 400 tickets tomorrow morning for the game at Cheltenham on February 14th. Tickets go on general sale from tomorrow morning. In other news this evening the FUNBUS looks as though it will be the only operator going to Carlisle for the game next Tuesday. Neither HUISA nor HUMADS are putting on a coach with HUISA suggesting they couldn't afford to run one with only little interest expected. HUISA are going to Stockport on Saturday but HUMADS are not going to this game. Edit - Funbus going by train. A former Blackpool winger is reported to be training with the Bulls. Canadian Youth international winger Michael D’Agostino is understood to be the player. Aged 22 D'Agostino was released by Blackpool in December by mutual agreement which suggests he is a free agent and could be signed at any time should Graham Turner feel he would fit into the squad at Edgar Street. He joined Blackpool in September 2007 after trials at Leeds. Howver he went on loan to Cheltenham Town in November 2007 and made 25 appearances for the Robins. Below is how Blackpool's website commented when D'Agostino left their club on December 16th. CANADIAN YOUTH INTERNATIONAL Michael D'Agostino today left Blackpool FC after his contract with the Seasiders was cancelled by mutual consent. The Vancouver born wide man arrived at Bloomfield Road on trial in the summer of 2007 and following a number of impressive appearances in both pre-season and the reserves was given a 12 month contract with an option for a further year. With first team football hard to come by at Bloomfield Road D'Agostino joined League One strugglers Cheltenham on loan and following an impressive six weeks at Whaddon Road the loan was extended until the end of the season. D'Agostino impressed Pool's watching scouts enough for the Seasiders to activate the option in his contract, but, the 21-year-old has struggled to make an impact this season and following discussions with Simon Grayson it was agreed that the player's contract with the club would be cancelled with immediate effect. Below is a flavour of the BBC Hereford and Worcester item on Vicinity Policing around Edgar Street broadcast this morning. Firstly sports reporter Dave Bradley spoke about the background. "Bulls News made a freedom of information request to the police asking about the charges they made. This season Hereford United have been charged over £23,000, Shrewsbury Town will pay only a fraction of that, similar sort of club, £1,356. Worcester Warriors have paid £3,648. Why the difference you might ask? "The police have previously told us they decide on the area around the club that needs to be patrolled in consultation with the club and then charge accordingly. Then a few words from Chris Powis, a contributer to Bulls News, who said this large difference in charges is exactly what the club doesn't need. "When you consider what Hereford United have gone through over the last ten or twelve years, to have them treated in this way does seem very unfair. "If it carries on as it stands it's going to be a huge problem financially to the club. And football at the moment is in a poor state anyway." H&W Hereford editor James Mcdonald then spoke about the numbers of police at Hereford games. "We've asked West Mercia Police how many officers they've sent to Hereford United games. They wouldn't disclose that under the Freedom of Information Act. They said it was an operationally sensitive number and they couldn't tell us." Mcdonald went on to say that he had counted 25 officers at the Oldham game a week last Saturday. "They made four arrests. Three of them Oldham fans and one local man - a streaker who was cautioned." Mcdonald also went to Edgar Street last night and spoke to supporters before the start of the Millwall match. "A club like this at this level every penny counts." "It's very difficult. When you see the likes of Shrewsbury getting charged £1,300 and we are being charged £23,500. And they get bigger crowds than us." "There are a lot of other clubs that haven't got the nerve that Graham Turner has. He's done marvels with our finances. So why should he give money away?" At the end of the item presenter Howard Bentham asked Bradley what the police and the football club were actually saying. "Not a lot to be honest. Despite several calls to Edgar Street, Graham Turner has not been able to speak to us for some weeks. He has previously said he believes they are the only club in the country being asked to pay these so-called vicinity charges and he's going to challenge that," said Bradley. "And the police declined to talk on air this morning. They have given us a one line statement saying they are still considering their position on the matter and they will be discussing it with other forces." The chairman of ESG Herefordshire Ltd, Sir Clive Richards OBE, has called for a by-pass and new river crossing around Hereford to be built. Commenting in the ESG annual report, the Chairman made mention of the fact that if the redevelopment is successful it will attract even more people and cars into Hereford. However the flooding issue has to be sorted before any progress can be made. "Following the close to record rainfall and flooding in 2007, which has nearly been equalled in 2008, considerable effort has been expended to ensure that flooding on the site is not going to be a massive impediment to its development and subsequent value. We believe that we have now moved to a workable solution," said Sir Clive. As regards the traffic issues the Chairman commented on the proposed East/West link road. "The second main infrastructure project has been the design of the new link road between East and West parts of our site together with street design. Additional effort has been invested in traffic flows, resulting from the planned downgrading of Blueschool Street and Newmarket Street to allow easier pedestrian and cycle movement between the old and new elements of the city." However nothing will work without a by-pass of Hereford. "The perennial traffic problem will never be solved until a new river crossing and a complete by-pass to our city is in place." As regards the future Sir Clive admitted that the 'credit crunch' will delay the project. "In the immediate future the emphasis of the company will be on the infrastructure and in particular completing the flood mitigation scheme and the design of the new link road from Commercial Road to Edgar Street." There is no mention of Hereford United and the football ground in the report. ESG has cost nearly £1M to date. It has been revealed that the ESG Herefordshire Ltd swallowed up £569,296 in administrative expenses in the year to 31 March 2008. The previous year its costs were £361,786. Together the past two years ESG has cost taxpayers over £900,000. ESG Herefordshire Ltd is the company charged with redeveloping parts of Hereford City Centre some of which border on Hereford United football ground. Last year ESG obtained their income of £545,000 from grants which are understood to come from Herefordshire Council. Whilst the salary of the chief executive is not revealed, his pension contribution paid by ESG for the last year was £16,940. Their auditors are in Birmingham. It is not known why a Hereford based auditors could not have been used keeping the accountancy fee and work in the area. Finally should ESG fail then the directors will only be liable for an amount not exceeding £1. Hereford United members, including season ticket holders, HUISA, and Junior Bulls, have only today (9am-4pm) to claim their tickets before they go on general sale. A steady queue was evident right up to kick-off last night, and there are not expected to be many tickets remaining for the general sale which starts tomorrow. Meanwhile, the club have announced that their Football In The Community scheme has been awarded Bronze status by the Football League Trust. FITC Officer Jamie Edwards has secured the award for the scheme, and the £24,000 in extra funding from the Trust, after just four months in the job. Bristol Rovers have denied receiving any bids for striker Rickie Lambert. Rumours around Huddersfield say they've had a £600,000 offer rejected and have submitted a £750,000 bid. Swindon striker Simon Cox is reported to be a £500,000 target of Bolton, with Huddersfield already being turned down at that amount. Southend were only able to name four subs for last night's match due to their injury crisis, and then saw striker James Walker withdrawn with a hamstring injury that will keep him out for six weeks. Leicester fans have opted for a blank home shirt for their 125th anniversary season next term. Their away shirt will carry the name of a charity. Northampton have signed Arsenal defender Paul Rodgers on a months loan. They are also giving a trial to former Wales international Andy Johnson, who was released by Barnsley two weeks ago. Bournemouth have agreed a settlement with the marketing company that had petitioned for a winding up order on the club. Walsall boss Chris Hutchings has confirmed that former Bulls loanee Chris Palmer has requested a transfer, but the club have also exercised an option to extend his contract until the end of the season. Hutchings says Palmer wants more security than that, and has so far refused to sign the extension. The Saddlers have released keeper Albin Kajtezovic at the end of his short term deal, the third such release of the transfer window. Crewe are giving a trial to Stocksbridge Park Steels striker Jamie Vardy, who has scored 16 times in the Unibond League this season. However the Railwaymen have been rejected by Hull keeper Tony Warner over a loan move. Bury striker Andy Bishop has signed a new contract with the club after protracted talks. Hartlepool and Swindon are likely to be in the hunt for striker Kevin Kyle after he agreed a termination of his contract with Coventry. Kyle spent two months with the monkey hangers under new Robins boss Danny Wilson. BBC Hereford and Worcester carried an item on their breakfast programme about the charges West Mercia police are requesting for vicinity policing around the Hereford United ground on matchdays. Details obtained from the police have revealed a vast difference in charges sent to Hereford United as opposed to Shrewsbury. Several Hereford United supporters gave their views on the matter which manager Graham Turner has spoken about in recent months. More on this item later. Hereford United manager Graham Turner was interviewed by Keith Hall for BBC Hereford and Worcester after tonight's match. "I thought we worked hard. I thought we needed the breaks at the right time. Their first goal killed us. Second goal was immaterial, we were chasing the game at that stage. Free kick for us, we left ourselves exposed," said Turner. "The first goal I think it took a double ricochet before it finished up bouncing into the back of our net. "I can not complain about the work. I can not complain in the main about the way players have attempted to perform. We've just not had the breaks. Sometimes you need the breaks and we didn't get those tonight. "Sometimes you need a bit of luck and I don't think we had any tonight. But we were up against a good side who passed the ball. "All in all no complaints about our players performance." A professional away performance from Millwall saw the promotion chasers overcome Hereford United 2-0 at Edgar Street this evening. The visitors took the lead in the second half when a double deflection saw Tony Craig open the scoring whilst in stoppage-time, Marc Laird followed up a Lewis Grabban shot to double their advantage in front of 3001 supporters, including 258 from South London. United were unchanged following the 1-1 draw at Walsall on Tuesday with Sam Hewson failing to recover from a groin strain. Millwall, who beat Hereford 1-0 at the New Den in late-October, handed Charlton loanee Izale Mcleod a start up top with recent record breaker Neil Harris having to be content with a place on the bench. One time Bulls' target David Martin started on left-wing. The first-half offered few chances at either end although Millwall were more dominant in possession. Good-work down the left-hand side by Andy Williams saw him provide a cross for Steve Guinan but his header lacked any power or direction. At the other end, a loose header was wildly struck by Martin and failed to call Craig Samson into action. The best chance of Hereford's first-half fell to Williams after he superbly bought down a long pass from Kris Taylor before spinning and hitting an early shot which flashed just past David Forde's far post. The visitors started to take control in the midfield and put pressure on the Bulls' backline with Gary Alexander controlling a flicked pass before shooting through a crowd of players but it was straight at Samson who gathered. Andy Frampton's header from a Martin corner harmlessly flew over whilst link-up between Alexander and Mcleod allowed the former MK Dons hot-shot to shoot goalwards but it lacked power and Samson held on with ease. Millwall's best chance of the half fell to Grabban at the back post after good overlapping wing play from Frampton gave him the opportunity to pull a cross back; Grabban controlled but the angle was tight and Samson parried his effort around the post. Towards the end of the half, a burst from Williams was stopped by Paul Robinson and Hereford were awarded a free-kick but as has been the case this season, Taylor's effort failed to rustle the net and fell wide. The Whites created an early chance in the second-half after good work from Williams out wide once again; neat footwork saw him nutmeg a Millwall defender before cutting back for Toumani Diagouraga who saw his left-foot shot blocked. Hereford won a number of set-pieces in good positions but Millwall were well organised at the back and dealt well with these; a Steve Guinan free-kick was tame and Forde had no trouble stopping the effort. Guinan also tried his luck with a flick header after Diagouraga had kicked the ball back into the box after a clearence but again Forde wasn't troubled. Alexander struck straight at Samson from long-range before Mcleod was replaced by Harris up top. The visitors opened the scoring soon after the sub with a goal from a corner. Martin whipped it in deep to the back post where Craig rose to see his first header blocked but it rebounded back off him and into the net. The away side took confidence from the goal with Grabban showing superb pace to speed away from the half-way line before sending a rising shot over the bar from 30 yards. Hereford introduced Simon Johnson for the ineffective Jennison Myrie-Williams and the former Leeds man nearly had an instant impact, latching onto a deep free-kick by Taylor and turning it into the danger area where Millwall's Alan Dunne slid the ball out just past the post for a corner. In the latter stages, Hereford had more of the ball but Millwall were looking dangerous on the break with Alexander twisting and turning to get past Taylor on the left before sending a powerful shot over the bar. At the other end, Johnson's low cross from the right was deflected into the path of Guinan who chested before dragging a volley past the post. Zak Whitbread replaced Martin late on before Millwall made sure of the points with a break-away goal. Grabban again used his pace to good effect to latch onto a forward pass from Alexander before swivelling on the edge of the box and shooting low towards the far corner; Samson made a fine-save to stop Grabban's effort but Laird was on hand to head into the open net. Millwall could have added a third deep into stoppage-time but Grabban's powerful left-foot strike was well held by Samson. Following the two good results to start 2009, Hereford were over-come by a strong and well drilled Millwall side. The Bulls lacked the midfield dominance experienced against Oldham last time out at Edgar Street and will look to get Hewson back to fitness as soon as possible. With six days remaining of the transfer deadline, Graham Turner will be looking to bring in a number of players with calls for a goalkeeper, right-back and striker from the support. Next up for United is a trip to Stockport County on Saturday. Hereford: Samson, Rose, Broadhurst, Gowling, Taylor, Myrie-Williams, Diagouraga, Smith, Done, Guinan, Williams. Subs: Veiga, Jackson, Beckwith, Gwynne, Johnson. Millwall: Forde, Dunne, Craig, Robinson, Frampton, Grabban, Laird, Abdou, Martin, Mcleod, Alexander. Subs: Pidgeley, Hackett, Whitbread, Grimes, Harris. Below are most of the stats from tonight's game at Edgar Street where the visitors Millwall ran out 2-0 winners over Hereford United. Sponsors, Baker Tilly, Man of the Match: Toumani Diagouraga. The ratings agreed with the sponsors as Diagouraga received an eight for his performance. Josh Gowling, Steve Guinan and Kris Taylor each received a seven. Leicester's goalless draw with Brighton means their lead is ten points after MK Dons had a shock home 2-1 loss to Leyton Orient. Peterboro are up to third after another late show saw them beat Crewe 4-2, with Scunthorpe fourth after a 2-0 win over Oldham. Millwall are up to fifth with tonight's win over the Bulls, with the Latics slipping down to sixth, and Leeds stay seventh despite their 2-0 win over Southend with Tranmere hot on their heels after beating Stockport 2-1. Down the bottom the Bulls now require five points after the points for Brighton and Leyton Orient, while Swindon moved clear with a 3-2 win over Walsall. Yeovil beat Huddersfield to move within a point of sliding Southend, with results over the last few days now making the entire bottom half of the table nervous. Carlisle's 2-2 draw with Hartlepool keeps both at a distance from the drop zone, but both fall down the table, as Bristol Rovers beat Cheltenham 3-2 to move up to 12th. In League Two Wycombe's lead is down to four after another dismal result saw them goalless at Macclesfield, with both Brentford and Bury closing the gap with home wins. Shrewsbury drop to sixth after a goalless draw at Barnet, while Chester were thumped 3-0 by a Port Vale side told by their manager that they're in a relegation battle. In the Conference Burton's lead stays 14 points after Kidderminster beat second placed Histon 2-0. Kiddy are one of six sides within two points of each other chasing the play-offs, with another being Wrexham despite their surprise 3-3 home draw with broken Northwich. Forest Green remain within a point of safety at the bottom after drawing 2-2 at Salisbury, with ex-Bull David Brown scoring their second. The Bulls lost tonight's League One match at Edgar Street 2-0 to Millwall. A disappointing midfield performance lacked any real bite, but the Lions forward line showed little accuracy in their shooting eventually winning the game with a pinball effort and a tap in after an excellent save from Craig Samson. Most of their efforts were either tamely sent down Samson's throat, or threatening the parked cars outside. The crowd of 3,001 - with 258 from Millwall - were left largely disappointed despite visiting keeper David Forde being kept busy by a sucession of Bulls shots and corners. BBC Hereford and Worcester are set to air an item tomorrow morning about police vicinity costs on match days at Hereford United. One of their reporters will be outside the stadium this evening with the aim of speaking to a few supporters about how they feel about police presence on match days. Recently Bulls News revealed that Hereford United had been charged £23,401.00 plus VAT for vicinity policing whereas Shrewsbury Town had been charged £1356.00 plus VAT. The item is set to be broadcast after the 7.30am news summary. FL To Wage Cap Across All Divisions? The Football League are considering extending the wage capping regulations across all three divisions next season. Currently only League Two sides are forced to comply with the wage capping regulations, limiting to 60% of turnover the amount that can be spent on players over the age of 20. Teams in the Championship and League One are monitored but not penalised in the way the likes of Morecambe have been, with a transfer embargo, for exceeding the regulations. Shrewsbury have this afternoon halted contract talks on new deals pending a definite announcement, with boss Paul Simpson telling their official site: "It's nothing against the players it's merely a case of having a better idea of where we are going to be at the end of the season. "There are talks going on at the moment between all the Football League Chairman to try and put some sort of system in place for budgeting at all of the Football League clubs. At this moment in time it's very early in discussions and we don't know whether these rules are going to come into place and if they do what they will mean to us. "This means that we don't really know what our budget will be for next year and until we get an idea of this we can't go committing ourselves to more contracts." £1million rated defender Zak Whitbread will be back in contention for Millwall for tonight's match at Edgar Street. Whitbread missed the Hull City match through suspension and is likely to feature, but fellow defender Scott Barron will miss out with an ankle sprain. Tresor Kandol will travel with the squad, ahead of the expiry of his loan tomorrow, but is unlikely to start. The Bulls expect Sam Hewson to be missing again, while long term injury casualties Stephen O'Leary and Sam Oji are also out. Jennison Myrie-Williams will make his first home start at Edgar Street after previously playing there for Carlisle, alongside Josh Gowling, and Tranmere - and ending up on the losing side both times. A Leicester bookmaker is paying out on the side winning promotion. Bookmaker Mark Jarvis is paying out around £3,000 to settle promotion bets, but will fork out a lot more if they secure the League One championship. The club themselves have announced a freeze on season ticket prices. Yeovil have brought in two players on a months loan to reinforce their paper-thin squad -Derby striker Aleksander Prijovic, and Swansea midfielder Shaun Macdonald. Prijovic is a Serbian u-19 international, while Macdonald was once linked with a similar move to the Bulls. Crewe have signed Blackpool defender Marlon Broomes on a months loan. He has only one first team appearance in the last three seasons to his name. Cheltenham have confirmed the departure of coach Bob Bloomer after sixteen years at the club. They could not guarantee his a new contract next season. Bristol Rovers are to release former Bulls trialist Richard Langley after he failed to prove his fitness during his short term deal. Chester chairman Stephen Vaughan has told boss Mark Wright he will have to stick to the current squad as the transfer embargo will remain in force. Former Crawley owner Azwar Majeed has admitted one count of cheating the public revenue, but has been released on bail so he can assist Police in unravelling his finances. He is likely to be jailed for the £1million fraud after £500,000 in cash was found in a safe deposit box. Cambridge reported to their AGM last night that they are about £60,000 in profit so far this season, but expect to make a loss of up to £200,000 by May. Ex-Bull Neil Mackenzie has joined Mansfield until the end of the season. He is their tenth signing since new manager David Holdsworth came in four weeks ago. Leyton Orient have loaned defender Aiden Palmer to Dagenham for a month. The 22 year old was a regular last season but has featured only once since October. The Star reports Crewe and Yeovil are interested in Weymouth forward Stuart Beavon, who has scored seven goals in the last five games. Huddersfield will bid £750,000 for Bristol Rovers striker Rickie Lambert according to the Sun. Hereford United coach John Trewick has been speaking about this evening's game against Millwall. “Millwall are well-placed in the league and it’s going to be tough," said Trewick as reported by the Worcester News. “But if we perform with the same enthusiasm and energy as Saturday, we will be fine. “Millwall have got a small bad element of supporters who like to cause trouble. 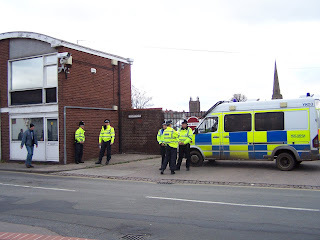 Meanwhile police sources have played down the likelyhood of a heavy police presence at Edgar Street this evening. It is understood that Millwall are unlikely to bring more than 200/300 supporters even though the club has subsidised the cost of coach travel to Edgar Street. In the Official Hereford United preview to this evening's home game against Millwall there is an interesting comment on two players. Seldom, if ever, over the years of previews has the Official Site made a statement along these lines. What the reasoning behind the comment isn't revealed but may be it signals that both players have upset manager Graham Turner in some way recently and that their futures at Edgar Street are not secure. Meanwhile season ticket holders are reminded to use ticket number 14 for this evening's game. Finally the sale of tickets for the away game at Cheltenham went on sale this morning to season ticket holders and members. The office will also be open before this evening's game for sales. Programme notes for the FA Cup 2nd round match against Millwall. HUFC were a Southern League team and Millwall were four points clear at the top of the old Third Division. Today we extend a special welcome to the Millwall players, officials and supporters, and look forward to an entertaining match. Our friends from London who won promotion last season when they finished runners-up in the Fourth Division, are once again enjoying a highly successful campaign and are clear leaders at the top of the Third Division at present. Needless to say they have not got there by luck and it has taken hard work and skill to win their way to the top of the table. I can vouch for the fact that manager Bill Gray has welded around him an efficient and well-drilled combination, having seen them in action at York and against Oxford during the last fortnight. But they are not unbeatable and if every Hereford United supporter here today gives us sufficient vocal encouragement I am sure we will give our Football League guests a run for their money. In the past we have pulled off quite a few giant-killing acts and given the run of the green and a few lucky breaks we can do it again this afternoon. I know I can count on the players giving everything they have got and it will not be for the want of trying on their part if we fail in our bid for a third round place when the draw is made on Monday. Before signing off I would like to congratulate the team on their fine 5-2 win against Chelmsford last Saturday. I was at Millwall at the time but from all reports I have received we played really well. Let’s hope for a repeat performance this afternoon! The Bulls won the game 1-0 with Ron Fogg grabbing his sixteenth of the season. HUFC: Peter Isaac, Selwyn Vale, Peter Timms, Peter McCall, Ray Daniel, Ian McIntosh, Brian Punter, Alan Rodgerson, Ron Fogg, Albert Derrick, Freddie Jones. MILLWALL: Stepney, Gilchrist, Cripps, Jones, Snowdon, Wilson, Rowan, Julians, Brown, Jacks, McQuade. You can now predict for the Millwall game tomorrow evening in the Bulls News Prediction League. The deadline is at 7.00pm. To enter, send in your final score and attendance predictions to bullnewspredictions@hotmail.co.uk. Remember to include your username. You can also predict for the Stockport game on Saturday should you want to. Kevin Wright from Cambridgeshire is set to referee the home game against Millwall tomorrow evening. It is believed this will be the first time Wright has refereed a game involving Hereford United. Wright has been in charge of 19 games this season to date and has given out 38 yellow and three red cards. Next Saturday David Foster from Newcastle will be in the middle for the game at Stockport where Hereford will be the visitors. The Conference are considering bringing back their wage capping regulations, and issuing harsher penalties to those clubs in financial trouble. They scrapped their 'Approved Player Budget' wage capping rules last summer with some clubs disgruntled that there were too many loopholes in the regulations to be effective. More than a dozen of the 68 Conference sides have admitted to financial trouble already this season, prompting officials to consider a u-turn. Those that do succumb to financial pressures will also be treated harshly, with plans being drawn up to automatically relegate clubs that enter Administration, liquidation, or even a CVA. Both proposals will be presented to their AGM in the summer. The Bulls entertain Millwall on Tuesday night in a League One match. The Bulls shock hammering of Oldham suggests anything is possible in this division. The reverse fixture, a single goal Millwall win, saw both sides reduced to ten men in a windswept match. The Bulls are likely to field six changes from that side, with three of those players - Randolph, N'Gotty, and Chadwick, all departed. Back then the Bulls were a shot-shy defensive minded team, but the use of the width of the Edgar Street pitch turned the League table on it's head last week - and it can be done again. Millwall's home form is the reason they're up in the play-off spots. One home defeat all season is promotion form but they have been decidedly shaky away from their New Den home and their vociferous fans, conceding four goals at both Brighton and Oldham. Top scorer Tresor Kandol remains on loan at the club for two more days but has been displaced by fellow loanee Izale McLeod in the last two matches. Hereford United vs Millwall, Edgar Street, Tuesday 27th January, 7.45pm. Hereford United have announced details of the sales of tickets for the trip to Cheltenham on February 14th. Sales to Club members, Season Ticket holders, HUISA members, and Junior Bulls will begin tomorrow at 10am til 1pm, then 2pm until shortly before kick-off of tomorrow's match, and on Wednesday during normal office hours. Remaining tickets will go on general sale on Thursday. Postal Applications must be received by Friday February 6th. Please note: There is no limit on the amount of tickets that you can purchase. Full details on the Official Website - link on left. Peterboro claim they were set to sign Lionel Ainsworth - but decided not to spend the money. The Peterboro Evening Telegraph says the fee that saw Ainsworth join Huddersfield was £400,000, with The Posh pulling out of the deal as "I don't want to bring players in just to sit on the subs' bench." according to boss Darren Ferguson. The paper also notes that Ferguson also had a deal on the table to take Theo Robinson to London Road but declined that for similar reasons. If the £400,000 fee is accurate then the Bulls may be in line for a further payout. Details of the original deal that took Ainsworth to Watford were never released, but it was described as having the potential to be the biggest in the club's history. The largest deal so far was Darren Peacock's move to QPR, which eventually netted the club a total of £440,000. During his limited first team matches at Vicarage Road the winger would have been unlikely to have triggered any clauses that would have realised that potential. The transfer of Andy Williams to Bristol Rovers included clauses for promotion and payouts once he had played a certain amount of matches, plus a 20% sell on clause, while Paul Parry's switch to Cardiff included payouts for matches played, an international cap, and promotion clause but no sell-on according to reports. Parry's original fee was £75,000 but the clauses have increased the total to £200,000. Brighton are to sign Preston midfielder Jason Jarrett on a free transfer. The 29 year old has 250 Championship appearances to his name and is negotiating his release from Deepdale. Swindon have signed four players, taking Doncaster defender Gordon Greer and Reading midfielder Hal Robson-Kanu on loan and signing trialists Hamdi Razak and Jean-Francois Lescinel until the end of the season. Leicester boss Nigel Pearson is fuming after Wolves midfielder Mark Davies was pulled out of his squad by the player's agent when a move to Bolton came up. Hartlepool assistant boss Ian Butterworth is expected to be named in the same job at Norwich once the two clubs agree compensation. Yeovil will be without midfielder Lee Peltier for a month with ankle ligament damage. Peterboro have dropped ticket prices for tomorrow's match with Crewe by £5. Walsall have transfer listed former Bulls loanee Chris Palmer after they were unable to meet his terms for a new deal due to their budget shortage. He is out of contract at the club, after his six month deal expired, but will remain at the Bescot initially. Brighton have taken winger Seb Carole on trial. He previously spent the 2005/6 season at the Withdean before moving on to Leeds. Stockport have sent loan striker Dave Mooney back to Reading after the player suffered an injury on Saturday. Huddersfield have slapped a seven figure price tag on teenage goalkeeper Alex Smithies, with a string of Premier clubs watching him. Crewe boss Gudjon Thordarson has admitted their lowly League position is hampering efforts to sign a defender on loan. Northwich have switched this weekend's match with Woking to the Cards' ground due to still being locked out of their own ground. They are yet to meet this season, and will play their home game when they were due to visit Surrey in April. Playing in Altrincham last week cost £2,500 but they got only 428 through the turnstiles. Stevenage have secured a six-figure sponsorship deal with a food company part owned by chairman Phil Wallace. Their Broadhall Way home will now be called the Lamex Stadium to help plug the hole in their finances. Conference football is regularly getting higher ratings than Setanta's SPL coverage. Leicester City have lost £14.2M in the year to May 31st according to figures just released. Their turnover was £14.1M. They blame the huge deficit on trying to avoid relegation to League One. Part of the problem can be put down to spending on new players. DJ Campbell cost £2.1M, and Steve Howard was bought for £1.5M. There was also money paid to two former managers Martin Allen and Ian Holloway. Leicester are backed by multi-millionaire owner Milan Mandaric, however the club is expected to lose money again this season. Match receipts for last season were £5.7M and income from sponsorship, executive suites and advertising increased to £3.2M. As yet it has not been revealed how much the club spent on wages but according to the Leicester Mercury they spent £10.7M the previous season. The club's debt - mostly owed for the Walkers Stadium - grew to £21.7M, from £14.3M. Leicester's turnover is around eight times higher than that of Hereford United. Hereford United manager Graham Turner has expressed his view that the Bulls are good enough to survive in League One. "We should have won the game, then we could have lost it. But we have had decent results, back-to-back, which was important for our confidence and I am sure we shall stay up. "There are certainly four worse teams than us in this division." Meanwhile the goals from Saturday can now be seen on Virgin Media - click the link of the left of this article. An article in the Birmingham Mail has suggested that the honesty of Andy Williams, the Hereford United striker, in not going to ground after being clipped by Walsall keeper Clayton Ince might have cost the Bulls the game. WALSALL benefited from the honesty of Hereford striker Andy Williams during the draw at The Banks’s Stadium. Doing the decent thing in football can cost you. Darren Wrack can vouch for that from September 2003 when the Saddlers visited Ipswich in the Championship. In the second half, with an Ipswich player having received treatment, Wrack threw the ball not out for a goal-kick but straight to home goalkeeper Kelvin Davis and was still chasing back into position seconds later when Darren Bent scored the winner for Town. On Saturday, it was Williams who was punished. Clean through on Clayton Ince in the first half, the striker was clipped by the goalkeeper but, instead of going down, Premiership-style, like a sack of potatoes, he stayed upright and tried to score. His reward? Nothing – as Manny Smith got in a great block. Ince might not have been red-carded had Williams gone down – he did get a bit of ball as well as player, but the referee would have faced a tricky decision. Both Williams’ conduct and Turner’s measured response only added to the credit Hereford took from the match. Turner is adamant his team won’t go down and let’s hope they don’t. The former Wolves and Villa boss reckons his opposite number Chris Hutchings will succeed at Walsall. “Chris has a good record at previous clubs and a lot of experience,” Turner said.